The foundation of each powder formula is a prebiotic, lignan-rich blend of organic defatted flax, sunflower and sesame seed fibre, which supports healthy immune and metabolic function. 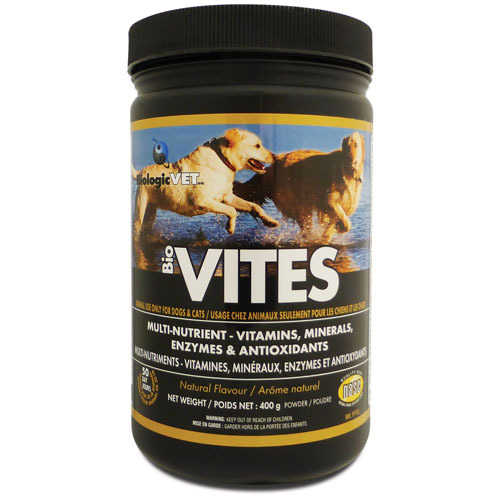 The free-form non-medicinal nutrients ensure an improved delivery of nutrition, facilitating greater use of the active ingredients, both in BiologicVET products and in your preferred brand of raw, dry or moist pet food. Prebiotics feed the naturally present healthy gut flora (bacteria) in your pet’s lower gastrointestinal tract. This encourages flora population and facilitates nutrient bioavailability; at the same time, limiting unhealthy bacteria and yeast overgrowth. Not only do prebiotics improve your pet’s digestive health, it improves their immune function. Lignans are naturally occurring phytoestrogens (plant-based hormones). They function as antioxidants and are converted into enterolactone and enterodiol (mammalian lignans). Their role is the control of normal hormonal balance and function, especially helpful when an animal has been spayed or neutered. Each Biologic formula includes additional enzymes and antioxidants to optimize the beneficial activity of nutrients in the maintenance of the animal’s general health. Enzymes are used by your pet’s body in many different physiological functions such as healthy cellular activity, detoxification and breaking down the nutrients in their food. The digestive system is the gateway to the immune system. Your pet’s lower gastrointestinal tract is where vital nutrients from their diet absorb and fuel healthy immune function and metabolism. Healthy immune response and metabolism depend on effective absorption and bioavailability of nutrients in order to sustain overall health. You’ll see the difference. Your pet will feel the difference. No pills and no fuss!